My family is publishing an Oregon Duck children's book. But we need help to fund the printing. We have started a kickstarter to help raise the funds. Does Pellum play the role of the grinch? My source just said Chip is officially back! It will be announced at Autzen press conference tomorrow afternoon! FYI. 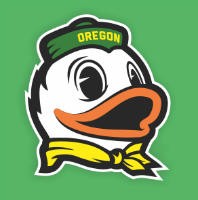 Have cleared use of the Duck likeness with the AD? I had an idea and even the use of "Webfoot: was a problem. The UO has approved the concept. We are sending it for licensing approval now. They will get like 3% of sales when it's finished. So we'LL see what happens.